Rocking bassinets can be a very useful addition to your newborn nursery, especially considering the number of design options available today. In addition to providing a sleeping space generally smaller and cozier than that of a crib, a rocking bassinet lulls your baby to sleep by mimicking the gentle, rolling movements experienced while in the womb. And because they’re smaller than a crib, you can place a rocking bassinet just about anywhere you’d like to have a convenient sleeping spot for your precious little one. 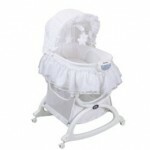 Today’s rocking bassinets are designed to be comfortable for the baby, and convenient for the parents. Many feature attached storage baskets beneath the bassinet, for bedding, diapers, or soft toys. 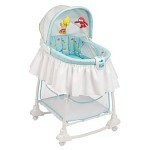 Other rocking bassinets may have wheels which allow it to be moved easily from room to room. Many rocking bassinets offer musical options, which allow you the option of adding soft, soothing sounds as your baby is gently rocked to sleep. When space is a consideration, consider a rocking bassinet that serves other uses, as well. Some multi-purpose models on the market can also be used as a changing table, baby carrier, or baby seat. When selecting a rocking bassinet, be sure it has a stable base, broad enough to avoid tipping. If you’re purchasing a portable folding model, be sure the legs lock securely in place when the bassinet is in use. Be sure to use only the mattress or pad included with the rocking bassinet, since it’s been designed to fit snugly inside to keep the baby safe. Most bassinets are designed to hold babies up to a certain weight limit – usually, no more than 15 pounds; when your baby reaches that limit, be sure to stop using the bassinet. You’ll also want to select a model that offers a locking mechanism to prevent the unit from rocking while you tend the baby. To make sure the rocking bassinet meets all of today’s safety standards, choose one which is certified by the Juvenile Products Manufacturers Association. This entry was posted on Tuesday, April 14th, 2009 at 9:03 pm	and is filed under Bassinet Guides. You can follow any responses to this entry through the RSS 2.0 feed. You can leave a response, or trackback from your own site.